On the lucky last Sunday night in March we've got some amazing music in store for you. 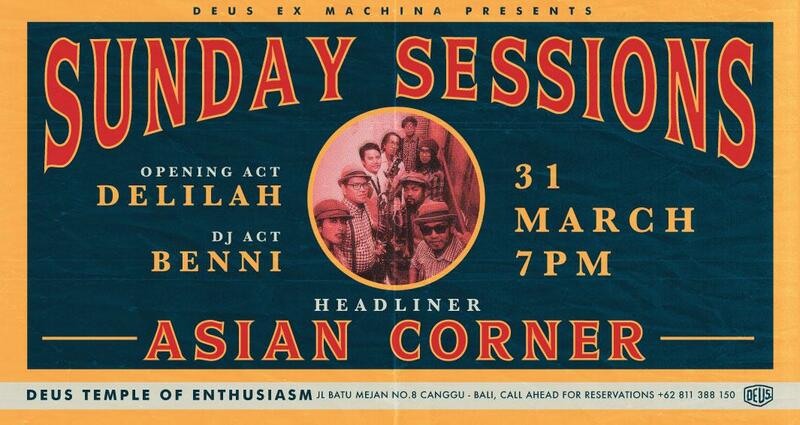 "ASIANCORNER" is coming back to the stage in the Deus Backyard after way too long an absence. A massive band with a massive sound. They're Blues and Rock n' Roll extraordinaire and they always figuratively light up the place whenever they're here. Helping them fill the bill will be "DELILAH' these guys would be the perfect act on a stand-alone night themselves. Beginning middle and end we're threading the musical needle with DJ BENNI twisting out tunes between the first two and taking us home on the Digital wheels. If you are around in Bali, head on over. It’s set up to be a night par excellence. Most importantly we'll be serving the whole thing up on a platter of good times.